Many of our clients enjoy our hot yoga and barre fitness sessions regularly at The Hot Yoga Spot as their primary form of exercise. Our robust class schedule is the perfect way to build muscle, burn calories, promote flexibility and feel strong. 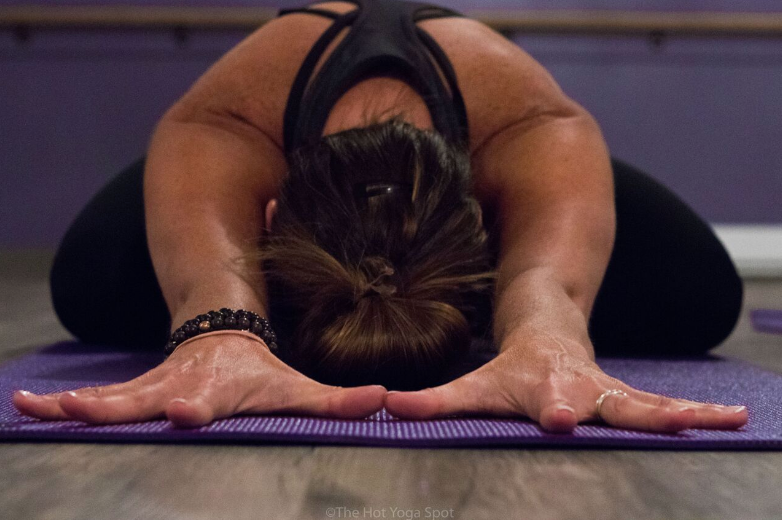 The Hot Yoga Spot’s varied styles of yoga and barre offerings allow you to retain customers and give clients one place to find all of their fitness needs. Although many of our members exclusively choose The Hot Yoga Spot for their primary workout routines, some enjoy other activities, such as running or CrossFit. For those people, weekly hot yoga and barre classes are the perfect way to supplement their regular exercise to find balance, promote flexibility and prevent injury. Yoga is a holistic practice that positively impacts the mind and the body. Classes challenge participants both physically and mentally and the benefits can be seen in both areas. By combining physical movement with meditation and controlled breathing, students achieve a more natural and relaxed state. In addition to improved strength and flexibility, the physical benefits of yoga include increased heart rate and cardiovascular output, heavy sweating to refresh skin, and a reduction in pain caused by injuries and chronic illness. When practiced properly, different poses can have an effect similar to receiving a massage. The contrast of tensing and releasing of muscles helps to relax and strengthen, while twisting and bending the body can encourage detoxification of the circulatory, digestive, nervous and lymphatic systems. Regular, consistent participation in yoga is proven to significantly reduce or eliminate everyday stress. Individuals who practice yoga enjoy increased energy, a positive mindset, less anxiety, and more relaxation and happiness. Yoga brings focus and awareness to the present moment and gives the mind a break from worrying about distant problems and stress. Practicing yoga calms the mind and over time it promotes mental clarity, improved sleep, inner peace and relaxation. These combine to lead to a greater sense of calm and a decrease in anxiety. The meditative benefits of yoga helps to focus the mind and optimize breathing. Our certified yoga instructors encourage deep, cleansing breaths and meditative reflection throughout the practice. This trains the body to use the diaphragm and fill the lungs fully and slowly while bringing attention and awareness to the present, while the world around you quiets. Over time, both the mind and body respond to a commitment to practicing yoga. The meditative aspects of class provide students with more balance in life, allowing them to better deal with stress in a healthy way. Through continued practice, our members find their life begins to reflect the calm they have learned to hone at The Hot Yoga Spot. yoga is good for you, increases flexibility and strength, enhances athletic performance and relieves stress. improve flexibility, stress relief, general fitness, overall health and physical fitness. Americans practice yoga on a regular basis. Americans are likely to try yoga in one year. is spent by yogis on classes, clothes, equipment and accessories each year. Americans practice yoga at least once each month. people practice yoga across the world. Men in America practice yoga, which has more than doubled from just 4 million in 2012.
increase in the number of people practicing yoga in America between 2012 and 2016.
of yogis have been practicing for 5 years or less. of Americans practitioners have children under the age of 18 who also practice yoga. Americans have tried yoga at least once. Specialty hot yoga styles include Bikram, Barkan and Baptiste. Hot vinyasa classes include gentle yoga, power yoga, flexibility flow, yoga detox and core flow. Fitness sessions include barre, ignite, HIIT, Pilates, iron yoga. Not hot classes include prenatal, kids yoga, aerial and acro partner yoga.